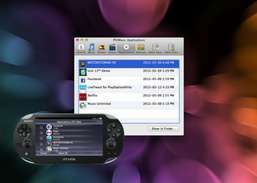 Transfer game saves, photos and music between PlayStation Vita and your Mac. 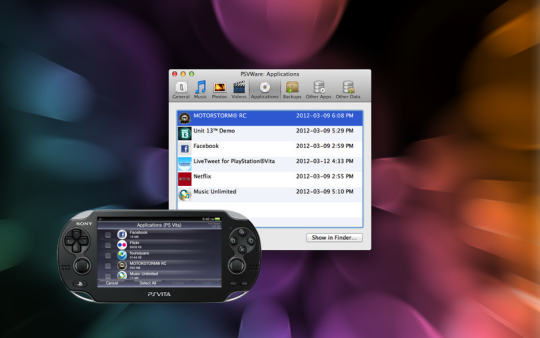 PSVWare lets you access your iLife media on your PlayStation Vita (PS Vita) system and backup/restore/copy game saves, games and applications between your Mac and PS Vita.Easily transfer music to and from iTunes, photos to and from iPhoto as well as your Videos. Transferring of music, photos and videos media to user-specified folders is also supported.Easily back up or restore any PS Vita game save, game or application that is stored on your PS Vita's memory card. Backups of older PSP titles and mini games are also supported. You can also perform a full system backup and restore.PSVWare integrates with the metadata on your Mac, providing quick access to your media library via your PS Vita without requiring any sort of pre-indexing. QuickLook thumbnail previews through out help you quickly identify content for transfer.Note: Videos must be in H.264 format to work with the PS Vita. DRM-protected content cannot be transferred. Create your own games without any knowledge of programming.